In Washington, the hypocrisy often runs thicker than the Anacostia River. This week, it even surpassed the sludge rate at the Blue Point Water Treatment Plant. As soon as news of Scooter Libby's conviction was announced, you had the law and order guys clamoring for an immediate presidential pardon. These, of course, are the same guys who impeached Clinton for deposition testimony regarding his sexual peccadilloes. The only exception in their ranks was Newt Gingrich's inner circle, who had their own hairs to split. Scooter Libby was convicted of lying to a FBI agent as well as to a US District grand jury. By the end of the week as Bush was getting on a plane to fly to South America to 'bolster democracy' there, Gingrich, sensing the vacuum left behind McCain for 2008, was confessing on evangelical radio that he just happened to be in the midst of an extramarital affair while he was leading the charge against Clinton. Of course, he emphasized, he didn't lie under oath to anybody about it. In Scooter's media defense the talking points had it that Libby had fallen on his sword for Cheney. Of course it wasn't that kind of falling on your sword that has serious, irreversible, personal, consequences.. This was the stunt man and ketchup kind of falling on your sword. The words that got Cheney and Libby so riled, and that launched a White House whispering campaign involving the outing of a CIA agent, happened to challenge the Big Lie that Bush asserted into his State of the Union in the lead up to the war. When Joe Wilson, who the Washington Post called a "blowhard" as recently as last week, published a New York Times Op/Ed piece stating that he'd gone to Niger for the CIA and then reported to the administration that the story about Saddam buying "yellow cake' was much less than it was purported to be, folks in the White House went berserk. The timing of Wilson's article a couple of months after the invasion just happened to undermine the new narrative they were trying to create as it became clear that no WMD program existed in Saddam's post Desert Storm Iraq. The Administration was in the midst of concocting a plotline that ran something like this: "Yes, it seems we might have been wrong about Saddam's WMD but so was the CIA and every other intelligence service, so who can fault us for erring on the side of security?." Wilson's piece cast an important ripple in the pond, calling attention to the mainly untold story of the triumvirate's (Rumsfeld, Cheney, Bush) heavy handed meddling with what they were getting from the major intel agencies . Somewhat ominously for them it also signaled a shift in support in the mainstream media Both the Post and the NYTimes had played a major roll in the big scare that laid the foundation for Bush and Rice's mushroom cloud claims. By running the Wilson story, the Times was signaling a back peddling from what might be called, its Judith Miller period. Fitzgerald's (the special prosecutor) investigation and eventual trial against Libby was a window into the way the innards of this White House operates and also a window into the cozy relationship between the (liberal) MSM and the political powers that be. For doing that in his highly professional and focused way, he did the rest of us who live outside that tiny circle a major service. For Judith Miller, the high flying reporter, it meant first a fall from freedom --she ended up spending time in jail for not revealing her sources, an act that might have gained respect for her-- then a loss of job and prestige as it became clear that her reporting represented a direct link between the Times front page and the Vice President's office. Through testimony made public by the trial, we later learned that one option considered to deflect the damage and get back at Wilson was for Cheney to go onto Tim Russert's highly influential Meet the Press show. Since by mainstream TV standards, Russert is one of the best prepared 'adversary' interviewers,, this piece of testimony should give us all pause. Cheney's press secretary at the time, Mary Matalin, a personal friend of Russert, figured Cheney could spin him at will. That became a twisted subplot in the trial when it turned out that one of Libby's lies regarded the same Russert. Libby told the FBI that he didn't remember his boss scribbling a note to him on a clip of Wilson's article but first got interested in the Plame/Wilson relationship when Russert brought it up in a telephone conversation a month later. Russert testified that he never made any mention of it in their conversation. In Washington where everybody knows everybody, outside of the reporters who worked the VP beat and Libby/Cheney, all agreed that the trail was the best show since Bush got to town. For once, the spinners, and the scribes who carry their water, were forced to talk under oath. Imagine, truth with some potential consequences... perjury! Little wonder then, that there is such a clamor for an immediate pardon. Jailing the message crafters in Washington ranks with revoking the fishing licenses of guys who stock and then over-fish their own trout ponds. In the same editorial that the Post slammed Wilson, the editors decried the potential that their off the record leaks might dry up. Again, that's about as likely to happen as the Titanic rising from the bottom of the sea intact and continuing on with its maiden voyage, band still playing on the deck. The real story, of course, was about the use and misuse of intelligence. There are hundreds of thousands of full time people generating intelligence for the government at a cost of billions of dollars a year. Yet, as we know, on every assumption for the War, the intelligence was wrong. Bush, Cheney and Rumsfeld chose to cherry pick as did the MSM. The main source of much of the information that got used in the infamous Colin Powell war case speech before the UN Security Council was derived from stuff supplied by guys, like Ahmed Chalabi, who wanted to goad the US into an invasion and other dubious types --Curveball comes to mind-- the CIA hadn't even talked to. 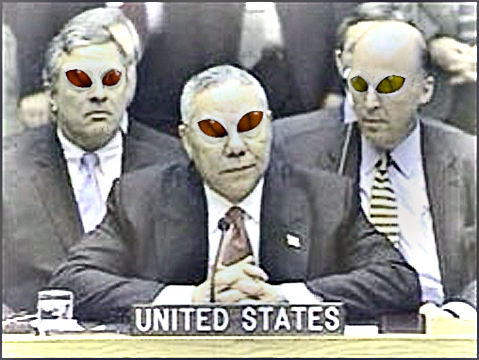 Remember that Powell had CIA head George Tenet and later to be made Chief Spy, John Negroponte right behind him as he created the most memorably embarrassing show in New York since Nikita Kruschev's shoe banging concert. . Sadly, the rule of the game, of course, is that in the face of willful power, spin trumps intelligence every time. We, and especially the MSM who inform us and upon whom we depend so heavily, have to question why we gave this leader a pass until he had failed overwhelmingly. That's despite the fact that this is a guy that right from the git-go seemed... well, haughty and uninformed. Amazingly, here's a President that did not get elected by a majority of voters but instead was inserted practically by a coup in which a majority of "constructivist" Supreme Court judges trumped the verdict of a state's supreme court. Ferdinand Céline, in his masterpiece, Journey to the End of the Night, describes the euphoria that engulfed all of France as the troops were being mobilized for the great, senseless, bloodbath that was to be called World War I. Perhaps, the call to war hits some ancient button buried deep within all of us. The press implicitly feeds on excitement. For a moment they get the eyeballs and attention they think they deserve. For the media bosses, there's a chance to boost revenues. Fear, it seems, has the same effect. Judith Miller made the nation's most prestigious front page writing about the potential for biological warfare and loose nukes in scary, half-guarded places in the outback of the former Soviet Union. The message was clear, guys like Bin Laden and Saddam Hussein could get a hold of these materials with little trouble. Today, of course, the same press is so loaded with words like 'disaster' and 'fiasco' when it comes to Bush43 and Iraq that we hesitate to use them anymore. Still, we can't help thinking about the fallout. Who gets to deal with the consequences flowing out of the fiasco? Is it all some kind of a game? Not, of course, when you read the fine print of the Iraqi Oil Plan that is being foisted on the al-Malaki government. Surprise, surprise, it would turn out to be the most favorable agreement for the Big Oil companies in the last 30 years. The Administration would trumpet the adoption of he Plan as a major political victory for them and Maliki. In truth, it would only lay the groundwork for violence down the road even if the lid could get stuck on somehow in the next year or two as we back out. We are the information society, after all. Commentators talk about information as the new currency. Intelligence, the non military kind, that is, is drawn to the country from all over the world. We've got great universities and leading edge businesses to draw them, a large population of our own educated and informed people, we've got public radio, bloggers and the Internet and we've got a giant media competing for our eyeballs to boot. All that intelligence is trumped by what? we have to ask. The thread running through all this is how easy it seems to be for the Administration to set the agenda. Events play a role but it's who gets to spin them that rules. What's needed today, of course, is smarts, intelligence of the real kind, analysis and action on our part, even if it takes sacrifice. This is a particularly definitive moment now, not because of terrorist threats, nasty as they might be, but because we are completely vulnerable to a major cut-off of the world's oil supply and will be for the next decade no matter what we do. The purported power of the Bin Laden movement among the Arabs has been his messianic cry for the unification of the Islam countries into one great Caliphate that would stretch from the eastern tip of the Philippines to the south of Spain. In reality, this would be about as likely as a call for the reinstatement of the Holy Roman Empire in Europe by a bunch of guys with sanctuary high up in the Swiss Alps. But the Arabs, who are wont to refer to the will of Allah (inshallah) regarding all things big or small, falling behind the rest of the world as this period of global economic integration takes hold, are leaderless. Lately, this leadership, even in their own backyard is inexoribly swinging towards the non-Arab Iranians, the Iraq War's big winners. Even back in what might seem, today, like simpler times, before the nation states, there never was a Caliphate, in the sense of a political entity, and there never was a Holy Roman Empire with more than temporary and limited sway. Bin Laden's restoration would mean wiping the slate clean of all the ethnic, tribal, cultural, national and historic notions of the varied peoples, not to mention the economic underpinnings of coreligionists in countries as varied from each other as, say, Indonesia and Tunisia. Today, Al Qaeda in Iraq, far from positioning itself as a unifying force among Muslims has clearly defined itself as a Sunni fighting force that specializes in terrorist bombings aimed at Shiites. of Iraq. This Iraq branch is also not far from the Saudi border and Saudi Arabia is Bin Laden's real target. With Saudi oil money, he would truly become as big a threat as we, by playing into his hands, have already made him out to be. The Persian Gulf is, of course, where most of the world's oil reserves lie. Without a steady supply of that oil, the world's economy would shut down in a number of days. The area is also as unstable today as a vial of TNT in a rapper's pants pocket. There are nuclear weapons within range, the US, Russia, Pakistan, India, and Israel all have the weapons and delivery systems. Iran's nuclear program is producing plutonium that could be used for a dirty bomb and they appear to be inexorably moving towards the possession of warheads and delivery systems. If the advance of Iranian influence into Sunni areas like Western Iraq isn't already a great enough concern to Saudi Arabia, Bin Laden adds the particular threat of resonating with the beliefs of a large number of the Saudi population. He has already proven effective in forcing the Saudis to resist US bases inside the kingdom. Now, quite reasonably given the botched situation, a majority of the US population wants a military pull out of Iraq. As US troops pull out either sooner or later there will be a power vacuum left behind. It's a given that the government in Baghdad will be Shiite led though not clear whether the Shiite leadership will fall to Moqtada al-Sadr In any case, Iranian influence is assured. The Saudis will want to come to the aid of their fellow Sunnis in Iraq. The question is how they will be able to supply military muscle to the Sunni militias and whether the central government in Baghdad will even entertain the notion of a semi-autonomous Sunnistan in some loose federation with them and the Kurds in the North. It is possible to imagine a grand accommodation that results in the expulsion of Al Qaeda from Iraq and some relative stability. This would require, however, some major stretches on the part of Sunnis, Shiites and Kurds inside Iraq and the Iranians, the Turks, the Saudis, the Israelis, the US, the Syrians, and some others, like Egypt and Jordan we've probably forgotten about and could easily fall apart even if accomplished. In this scenario, Iraq ends up as a very loose federation that mainly shares oil revenues and a permanent solution is found for Israel and the Palestinians. This unfolding, if remotely possible, would require, even with the most intelligent US leadership in generations, and the greatest combination of feats since Hercules ran out his string. What's more likely, best case, is a muddle through that manages to keep the oil flowing for a few more years, at least. But sooner or later the oil spigot will be shut off. A side-note is the numbers coming out of Saudi Arabia: for the last couple of years their production has come in lower than anticipated. Some of the leading geologists in the "peak oil" camp make the point that estimates of state secret Saudi reserves are unofficial and have remained level even after thirty years of steady pumping. Assuming that the supply of cheap, abundant oil is going to end either gradually or abruptly, it seems, utterly ignorant on our part to move forward in business as usual mode. Our vote in the next election will go to the first viable (dare we say, intelligent?) candidate who promises to launch a Manhattan Project like effort to accelerate (clean) energy independence. But even then, it may be too late to avoid what could abruptly result in a mad max scenario as countries fight desperately for energy sources.